With the Society For the Protection of Ancient Building’s National Maintenance Week fast approaching (23rd – 30th November 2012), the timing of a recent survey carried out by propertECO was particularly apt. 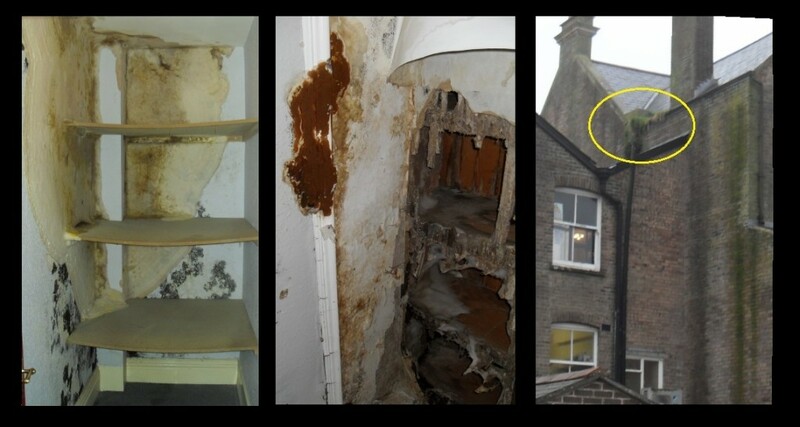 Upon inspecting a Listed Building in Dorset, our surveyor was faced with evidence of a severe outbreak of dry rot (Serpula lacrymans), which had spread through several floors of the building. A visual inspection externally identified the prime suspect for the root cause of the rot; rainwater goods on the roof valley gutter blocked by plant life (circled below). Simple, routine maintenance of the rainwater goods could have prevented water entry into the building, the subsequent rot colonisation and substantial cost of treatment.